Will Epic address the Hand Cannon in the face of criticism? Since Respawn Entertainment released Apex Legends a few days ago, many have tried out the new battle royale game—including several popular Fortnite players. But a new game isn’t the only reason why some of the more prominent players are playing Apex. Some of the players are avoiding or outright refusing to play Fortnite with the Hand Cannon. That list of players includes Noah “Vivid” Wright, Sam “WishYouLuckk” Salcedo, and even Jimmy “HighDistortion” Moreno, who became the first player in Fortnite: Battle Royale to reach 100,000 kills in January. Fortnite is so boring lmfao. It’s not even a battle royale. It’s a “get wall replaced by my deagle or get rammed by my plane” simulator. THATS IT. EVERY GAME. Each of these players has publicly stated how much they dislike the Hand Cannon, and think it should be removed from Fortnite. 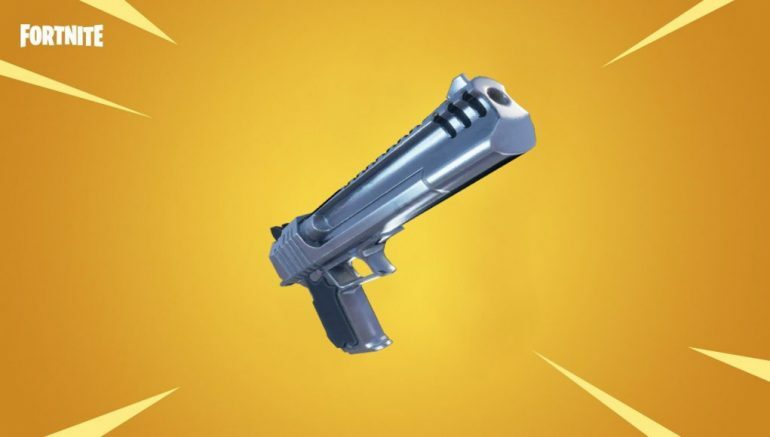 HighDistortion tweeted on Wednesday that he wasn’t going to play any Fortnite until the Hand Cannon was vaulted. The current alternative to Fortnite is Apex Legends, which came on to the battle royale scene earlier in the week and has already reached one million registered players. The one million player mark was actually reached in just eight hours by Apex, beating out Fortnite’s mark in 2017—which shows just how quickly players have taken to Respawn’s newest creation. The opinion that the Hand Cannon and planes were a problem was an opinion shared by the majority of comments on Twitter, but there was a noticeable minority that told the players to stop “complaining” and just play the game. Fortnite developer Epic Games may decide to ignore these players’ tweets, but it’s very obvious that there’s a section of the player base that doesn’t enjoy the game as much with the Hand Cannon being as strong as it is. And Respawn has the opportunity to capture many of those players’ interest and turn them into regular Apex Legends players.